The Stones' Home: Sledding Today! 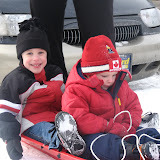 Today, David got to go sledding with his best friend, Jacob. He absolutely loved it!